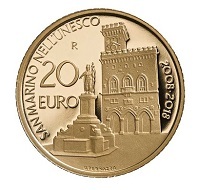 December 6, 2018 – San Marino has issued a gold coin in celebration of the symbolic value of the inscription of San Marino Historic Centre and Mount Titano in the UNESCO World Heritage list on the 7th July 2008. San Marino / 20 euros / gold .900 / 6.451 g / 21 mm / Design: Antonella Napolione (obverse) und Uliana Pernazza (reverse) / Mintage: 500. San Marino is one of the world’s oldest republics and the only surviving city-State, representing an important stage in the development of democratic models in Europe and worldwide. It bears witness to the establishment of a representative democracy based on civic autonomy and self-government. The reverse side of the coin shows two of the most representative monuments of the Republic of San Marino: the Liberty Statue and the Government Building. More information on this coin and other San Marino issues is available on the Ufficio Filatelico e Numismatico website. You can learn more about the World Heritage Site on the UNESCO website.